Wow! That chart is fantastic. Thank you. I dearly love Lady Carlyle. It's amazing indeed how different the non English china is, but a lot of fplks haven't held enough comparisons to know. Nice to know about the nuts...we have a lot in our home. Have a wonderful week! If I had that gorgeous Lady Carlyle teacup, she would be my very fave too. Also Pistachio nuts are my fave too. 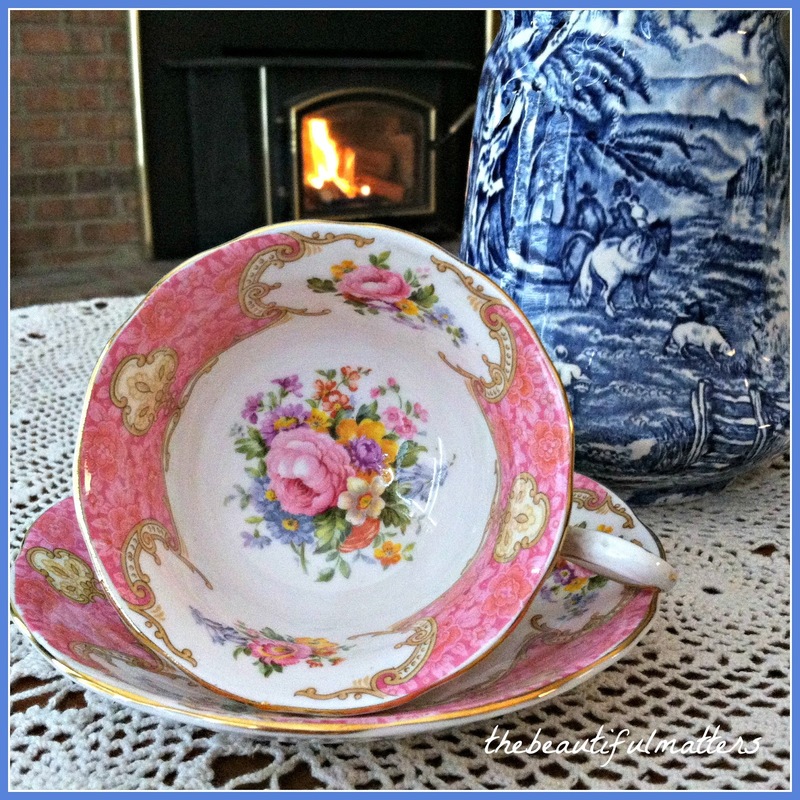 Thanks for sharing pretty lady; I will try to join Sandi for her tea party Tuesday with my favorite teacup, which I don't know which it is, lol! Your tea cup is a true beauty and I can see why you love it so. Plus it was given to you from your daughter which makes it even more special. Thanks for the little tid bit about the nuts. Have a wonderful week, my friend! Hugs! 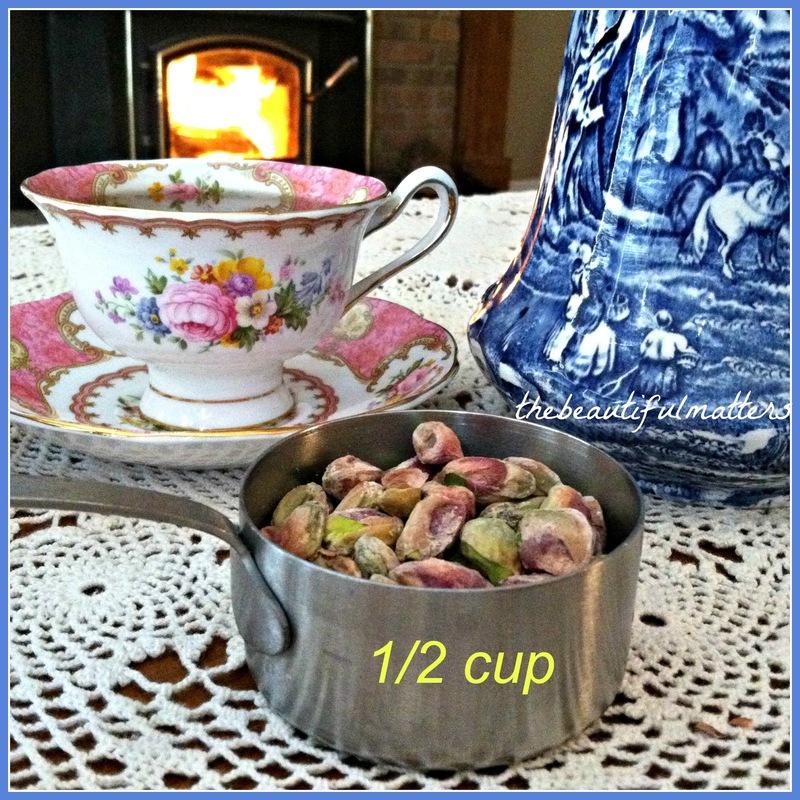 What a beautiful tea cup and I love pistachio nuts too. Have a wondeful week! Yes, your Lady Carlyle is a beauty and such a thoughtful gift from your daughter. My late beloved hubby and I loved to snack on pistachios. 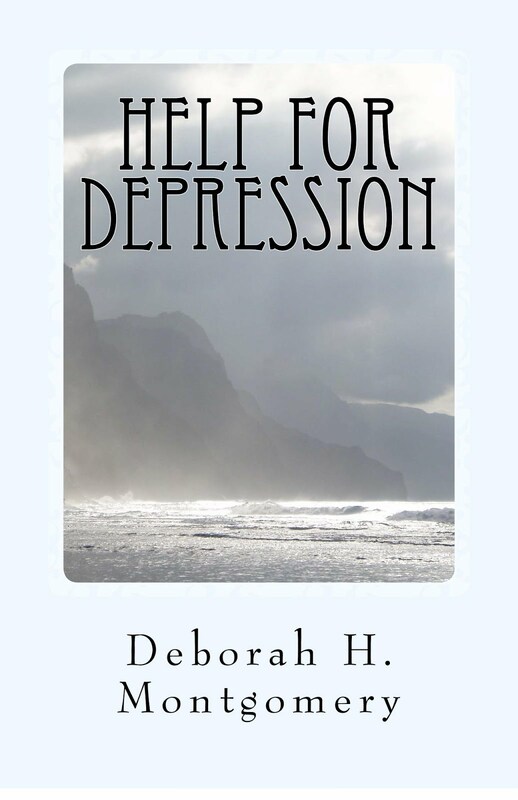 I haven't had any in awhile and I'll have to remedy that, Deborah! I can just picture you with your lovely cup of tea, cracking pistachios by your cozy fire. Very pretty tea cup. Love your yellow flowers in the blue pitcher. 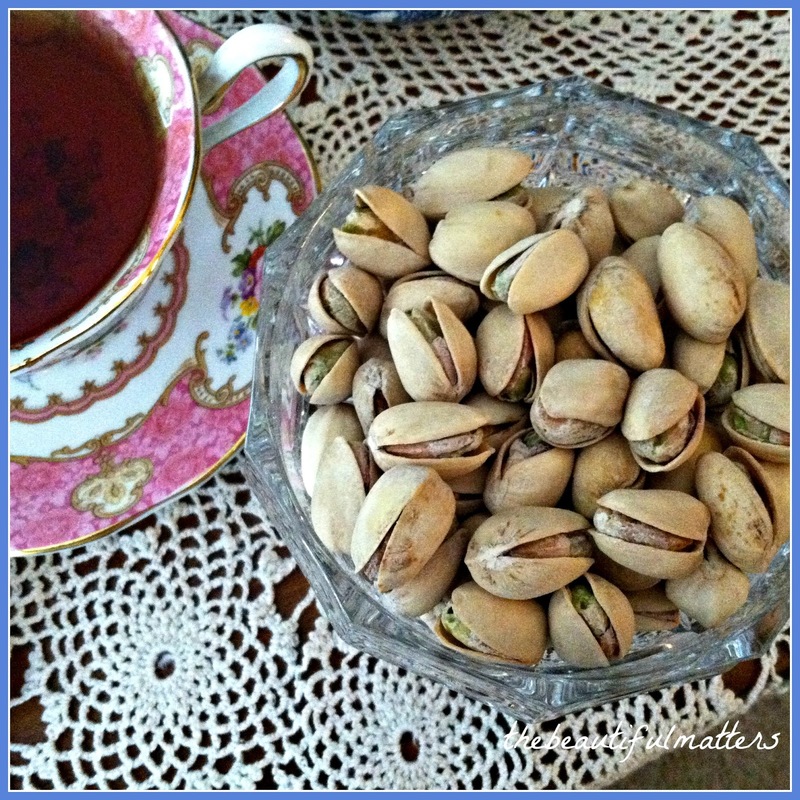 Your pistachios look like the perfect snack to go along with your tea. Well, I can certainly understand why this teacup is your favorite...it is really beautiful...what a wonderful gift from your daughter! It's funny you should mention pistachios...I picked up a package (in the shells) just the other day for the first time. I had had them many times in mixed nut but never bought them by themselves. I actually really liked shelling them but my hubby not so much. A couple of days later, I bought a package of the shelled ones for him...well, OK, for me :) I really like them alot and I'm glad to know you can have so many for 200 calories! Your Lady Carlyle teacup by Royal Albert is stunning. It would be my favorite, too. Extra special that it is from your daughter. I love pistachios ... just don't know when to stop! :) Happy Tea Day! I love Lady Carlyle too and I also have one. She is a gorgeous teacup! 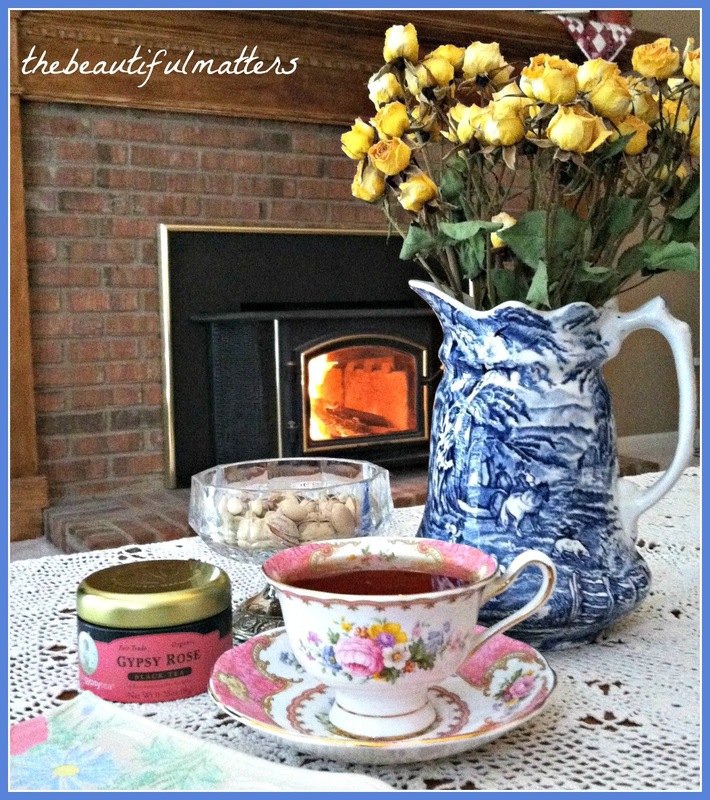 What a pretty tea vignette you have set up in front of the fire. Your yellow roses look perky in the blue pitcher and the nuts look delicious! I am always amazed at the calories in a handful of nuts. Your pistachios were a wise choice. Thank you, my friend, for joining my tea party today to help me celebrate. Have a lovely day. That truly is one remarkably gorgeous teacup, Deborah. And the fact your daughter gave it to you makes it doubly lovely. Thanks for sharing. Your daughter has excellent taste! I also enjoy pistachios, especially pistachio ice cream, although that's probably not very healthy! Your teacup is a lovely piece of art! I collect Spode and I found out too that the pieces being produced in recent years can not only have a different feel to them, the colors are not as subtle. I didn't know that about nuts! Yes, I agree the vintage Lady Carlyle are thinner and more delicate than the current pattern made in China. I do believe there are two earlier versions of Lady Carlyle made in England. The earlier is the more delicate. I recently bought pistachios at my local fruit market. Now i won't feel guilty eating one or two. Deborah you have really great taste in teacups! I picked the same teacup. It looks lovely here by your fire. Lovely cup and yes, I too love the thin, vintage quality china! 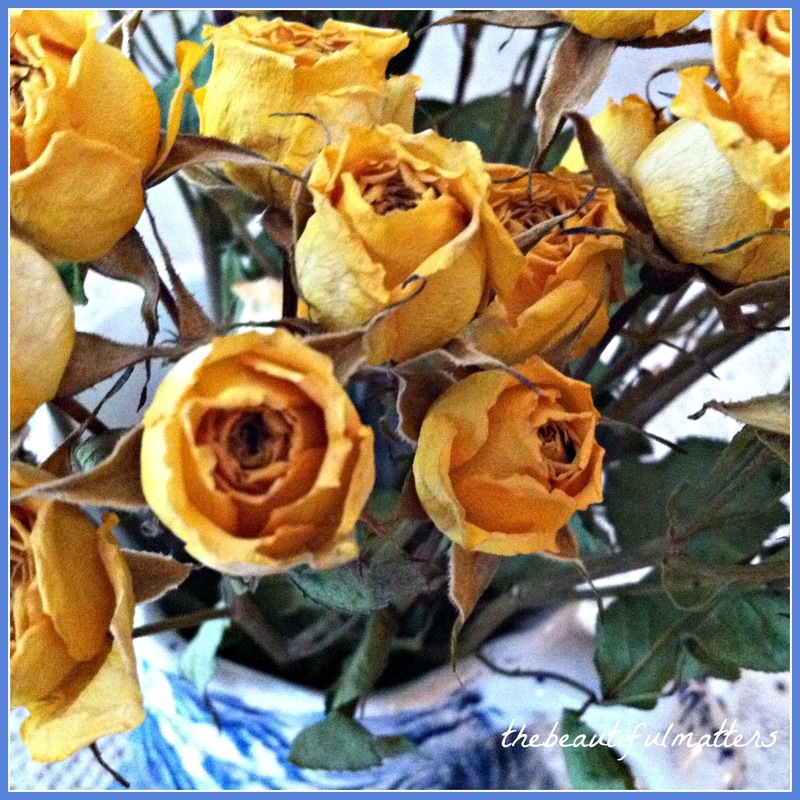 Those dried yellow roses look incredible! Hi Deborah, Your Lady Carlyle is a gorgeous teacup. How special to have from your daughter. 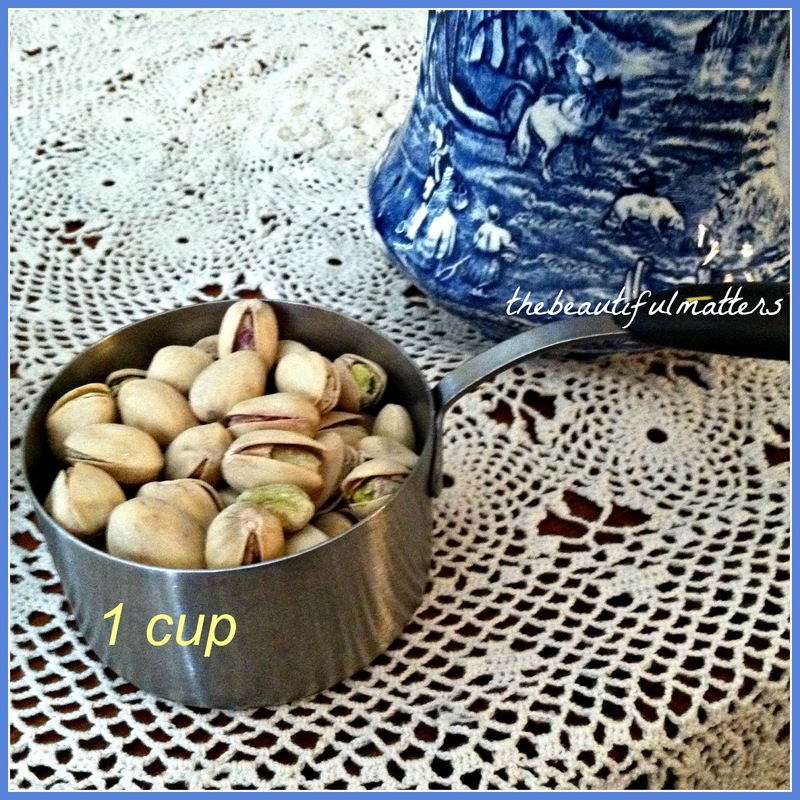 We snack on nuts around here too and love pistachios along with almonds and walnuts. When I get a 3 o'clock slump, I grab a handful of nuts and feel revived. Lady Carlyle, how pretty! What a sweet daughter you have. 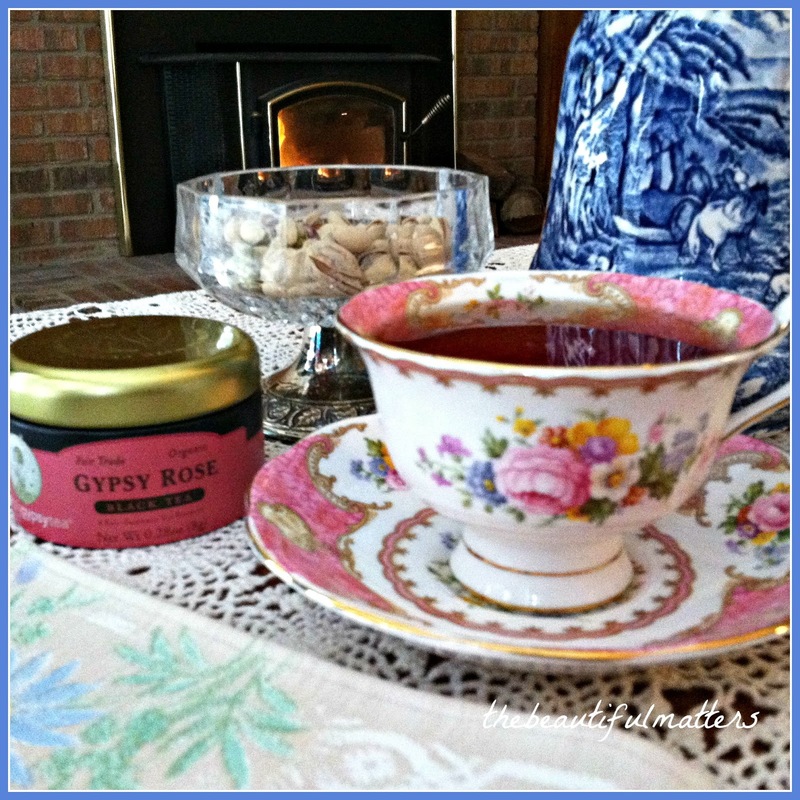 If we put your favorite teacup in a contest against my favorite teacup, yours would get my vote! (and I love mine!). You certainly picked a lovely tea cup to share for Tea Time Tuesday's anniversary. 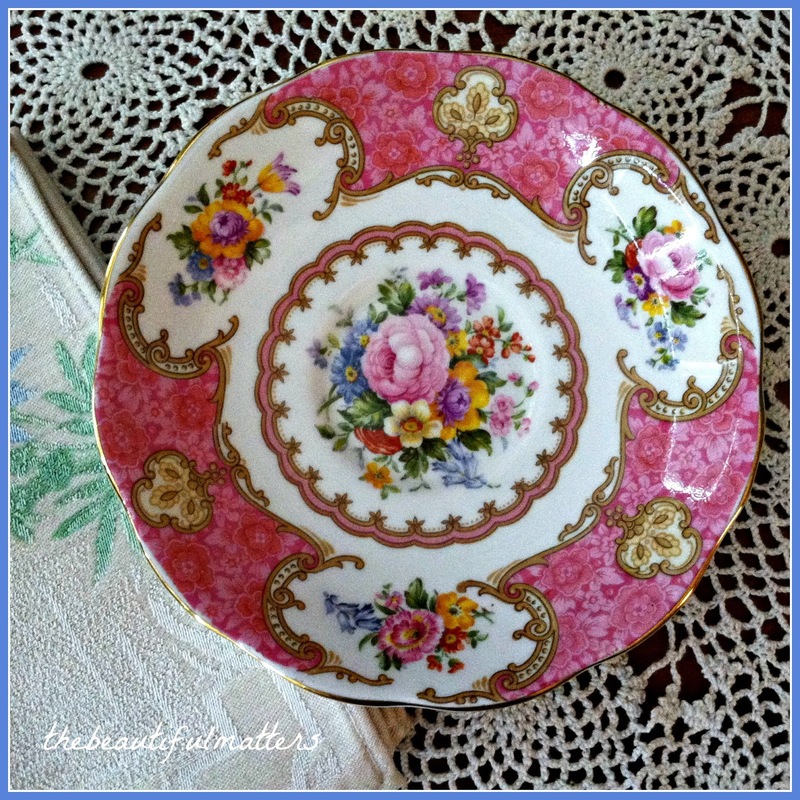 I didn't know this pattern by Royal Albert but it does show superb decoration, very suitable for this anniversary tea party. What a beautiful teacup, pink is my favorite color. My daughter gave me a pretty pink teacup that I had always wanted last year. Aren't daughter's wonderful and thoughtful! A beautiful teacup. Glad you got the English one. Deborah, Your Lady Carlyle teacup is one of the prettiest one I've ever seen! Stunning! Truly a beautiful teacup and I can see why it is among your favorites. As I read more tea time blogs I learn more about china in general , and that cannot be separated from the history of the peoples and countries producing the china, nor the tea cultures they practiced, and even today still practice. 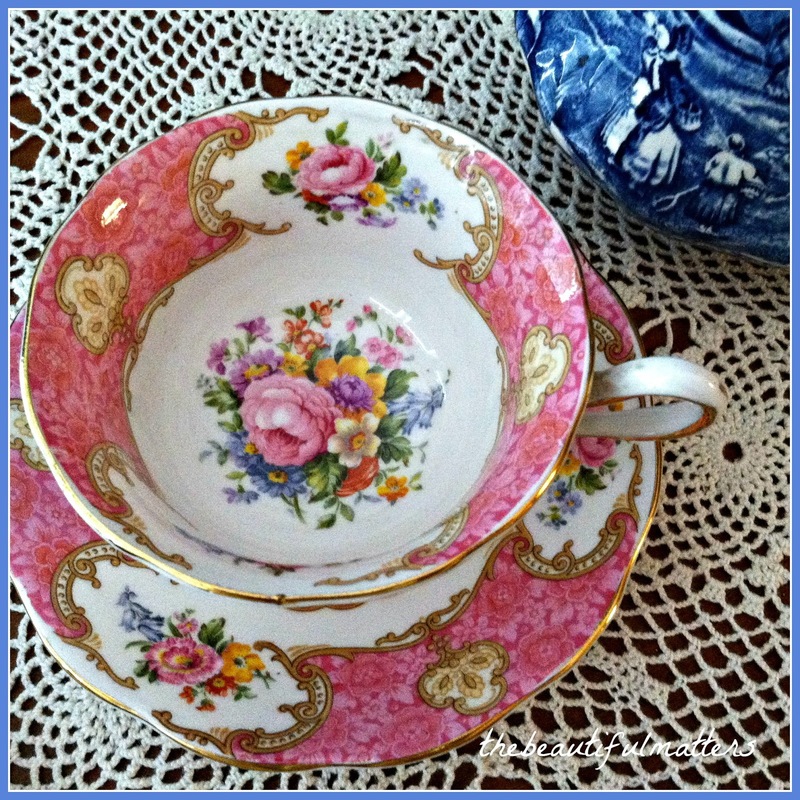 I believe our undervalued ( by those not concerned with teatime blogging ) tea time posts will one day prove to be a valuable source of the every day tea & coffee break practice (s) of most families in this & the previous century. Drooling over that lovely tea cup! Not so much the nuts - allergic! Hi Deborah! Your Lady Carlyle teacup is gorgeous. Your daughter definitely did good--I can see why it's your favorite. 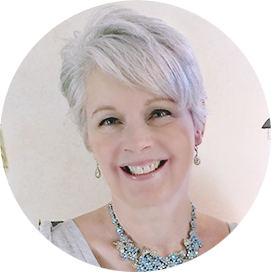 I learned a lot on your blog this morning! I love nuts and will now have your chart tucked in the back of my mind about how many I consume. Your tea cup is just beautiful!